The UK’s Transport Systems Catapult has announced that businesses and leading academic institutes it leads are to develop state-of-the-art innovations for governing bodies within the Middle East – starting in Dubai. It explains that the programme is the result of an alliance between The TSC and Dubai & UK based innovation and IT Infrastructure company TEXPO which signed an agreement in principle to explore potential prospects in the United Arab Emirates earlier this year and have now agreed a “dynamic framework which will administer innovative programmes in Dubai to develop leading-edge transportation systems”. The TSC says that, in collaboration with TEXPO, it will co-ordinate innovative small business and universities in the UK to develop a series of projects to alleviate congestion, improve transportation safety and augment Public Transport Ridership. The projects, extensively based on AI and Blockchain, will improve application of data across Dubai’s public transport, Traffic and Roads Agency, Dubai Taxi, Rail Agency, and Licensing Agency. These projects will also address Connected and Autonomous Vehicles, Virtual Reality testing, Artificial Intelligence and integrated business models. It adds that this working framework will help TSC and TEXPO predict and identify the Dubai Government’s ongoing and forthcoming requirements and challenges around hosting the World Expo 2020 and achieving their 2030 Mobility strategy. 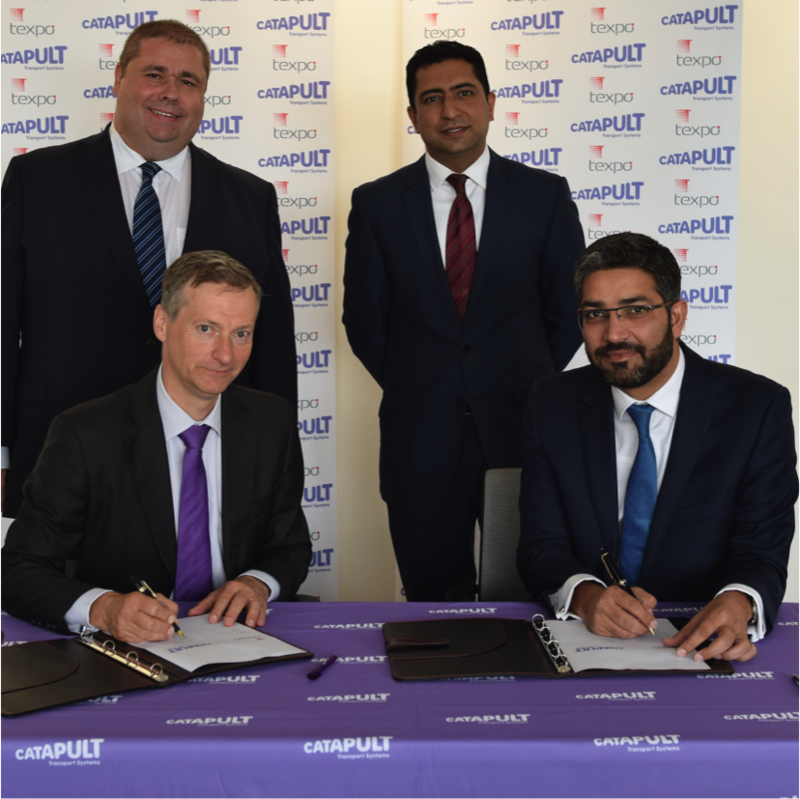 CEO of TEXPO, Raheel Alam (pictured seated right), commented, “Signing this agreement with the Transport Systems Catapult is a notable instance of TEXPO steering the most progressive innovations by various UK companies into the region we operate. This mutually conducive collaboration would prove advantageous to several Governments within the UAE and beyond. It is indeed a great privilege and honour for TEXPO to be playing its part in the expansive growth of the UAE, particularly Dubai. We believe that our world-class innovation around transportation and logistics can play a strategic role in the advancement of Dubai and help set up the future cities and modern transportations as per the directives of H.H. Sheikh Muhammad Bin Rashid Al Maktoum, Vice President of UAE & Ruler of Dubai”.